We have approximately 40 volunteers who help to cook, prepare and serve meals during the week. Others pick up and deliver food to the Soup Kitchen. On designated Sundays, church groups and volunteers serve brunch from 9:30 - 11:00 am. 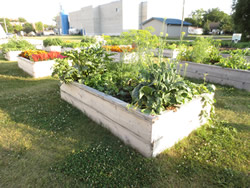 When you plan your garden, plan to grow some vegetables for the Soup Kitchen. Carrots, potatoes, lettuce, tomatoes, green beans, cucumbers, etc. are all welcome. Your participation in fundraising events and your cash donations are greatly appreciated. You can also donate through Canada Helps by clicking an the Donate Now button.